Ohmic losses in plasmonic structures have always been considered as a major drawback for long-range propagation and the realization of efficient devices. Yet the possibility to control the rise of temperature with illumination parameters (wavelength, polarization) has fostered a strong interest in the NanoOptics community . This photo-thermal energy conversion originates from the strong local field enhancement associated with the plasmonic resonances that goes along with an enhanced absorption in the metal. Metal nanostructures can therefore increase the temperature in their environment and be used as integrated heat nanosources . This active research field, called thermoplasmonics, could potentially lead to breakthroughs in several fields like nanomedicine, nanochemistry or thermo-hydrodynamically assisted plasmonic trapping and manipulation . Very recently, plasmonics has fostered another realm of applications in which dissipative effects are being advantageously utilized. Besides their widely used propensity to enhance and confine the near–field electromagnetic intensity, metal particles and nanostructures have revealed a great potential as local heat sources. 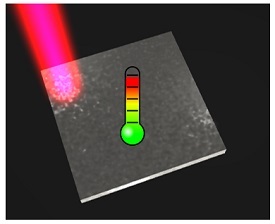 This activity is developed both at the experimental level (including local temperature measurements through local spectroscopy) and a completely self—consistent scheme based on the Green Dyadic Functions (\sf GDF) formalism that compute the local field intensity and temperature distribution inside and around a particle array by including the coupling with the substrate. This scheme is applied to design and optimize new concepts of thermoplasmonic metasurfaces integrated in coplanar geometry [4,5].